Rock and Roll fans rejoice, as the king has hit the slots with “Elvis Multi-Strike” slots. This rocking game from Wagerworks and IGT offers players the chance to spin the reels in hopes of winning a ten thousand coin jackpot. Coin values range from one cent to five dollars, offering players the chance to win big with this game. The graphics and sounds in “Elvis Multi-Strike” slots are very exciting, including lots of pictures of the king as well as a number of different songs. Symbols on the reels include the letters in Elvis as well as the TCB logo, the pink Cadillac, Elvis, Graceland, a teddy bear, a guitar, and a microphone. Bonus symbols include the Rockin Respin Photo Memories and Wild Bonus symbols as well as the Fan O’ Meter. With such a large jackpot, players betting the maximum number of coins stand to win a lot in this game. 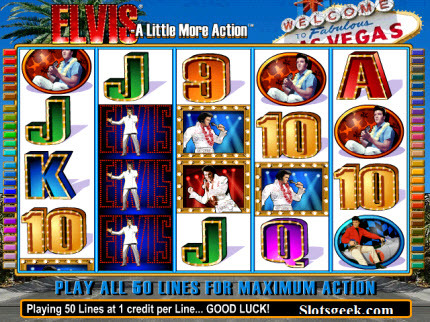 There are a total of sixty paylines to be found in “Elvis Multi-Strike” slots. There are three sets of reels in this game, with twenty paylines on each set. Players betting on all sixty lines are offered the most ways to win, and the payout is multiplied by the number of coins bet per line. There are a tremendous number of payouts offered in “Elvis Multi-Strike” slots. Players who get all five letters in the king’s name on a payline are offered the ten thousand coin jackpot, while players spelling E-L-V-I are paid one thousand coins. E-L-V pays three hundred coins, E-L pays thirty, and E pays two. The TCB logo pays one thousand coins for five on a payline, five hundred for four, two hundred fifty for three, thirty for two, and two for one. Players getting five pink Cadillac’s are offered five hundred coins, while two hundred fifty are paid for four, fifty for three, and four for two. The same payouts are offered for the Elvis symbol. Five Graceland symbols or five teddy bears pay two hundred fifty coins, while four pay one hundred and three pay ten. Players who get five guitars or five microphones are paid one hundred fifty coins, while four offer twenty-five and three pay five coins. Players winning less than three thousand coins are also offered the chance to gamble their winnings by choosing whether the next card will be red or black. The odds are always 50/50, and players can stop and collect their winnings at any time. When three fan-o-meter symbols land on a payline, a bonus game is triggered that lets players choose a TV and win a prize based on the crowd reaction to the song Elvis performs. Two photo memories symbols trigger a bonus in which the last three reels will re-spin, offering additional payouts, and these two symbols plus three wild bonus symbols trigger a feature that allows players to spin a wheel of Elvis photos and collect associated prize amounts. There are many bonuses and prize amounts offered in “Elvis Multi-Strike”, making it an excellent game for music fans and slots lovers alike. Wagerworks is the only online slot machine develope who has full rights to offer the IGT slots online including IGT's Elvis slot machine.